Nice to meet you, my name is Lambchop! 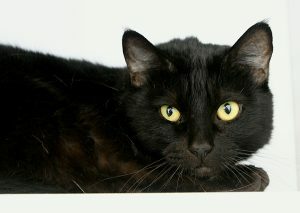 I am a very sweet and sensitive 8-year-old boy kitty that wants nothing more than to find a quiet home to snuggle up in. 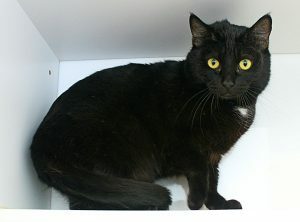 I have taken a few weeks to adjust here at the busy shelter, but now that I know I’m in a safe place, I have begun to open up to people and show just how sugary-sweet I can be. Whenever someone stops by my condo to say hello, as soon as they reach in to pet me, my whole body relaxes and I start to “make muffins” with my paws almost immediately. I will roll around and arch my back as if to say “More pets! More pets!”. I have big beautiful yellow eyes that people notice right away, since they’re round and almost hypnotizing like the Cheshire Cat! I’m kind of a round boy myself, which ads to my cuteness. I still have a lot of years left to offer love and some serious affection to my future family, and I’m in excellent health. The staff here even gave me a dental so my teeth are nice and clean! If you are looking for a marvelously mellow man like me, be sure to stop by Pixie today! I come to you fixed, vaccinated, micro-chipped (and with a recent dental already done!) for an adoption fee of $100.